Paul Kirdorf dribbles past a defender. MACOMB, Ill. – The 2018 spring season kicked off for the Western Illinois men’s soccer team this past weekend. The game was initially set for Saturday but after inclement weather was rescheduled to Sunday. 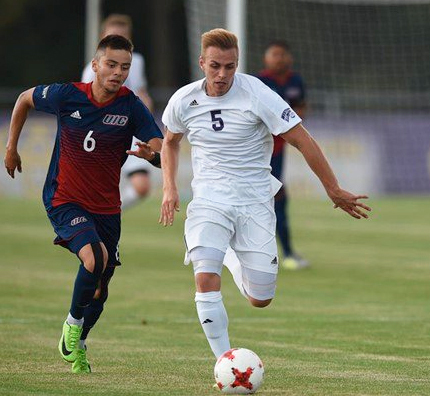 The Leathernecks took on the Bulldogs of Truman State University and tied 0-0. Truman State is a Division II team from Kirksville, Missouri. The Bulldogs went 4-12-1 in the 2017 season. The Leathernecks went 5-10-1 in their regular season. The game was played on the turf of Hanson Field because the grass on the John Mackenzie Alumni field was not in good condition due to the rain from Saturday. Despite the game being friendly, both teams came out very competitive. Most of the match was an even battle between the Bulldogs and the Leathernecks. The game remained 0-0 for the first half as neither team could find the back of the net. The Purple and Gold had many chances to score throughout the half, but almost all of the shots on goal were to the hands of the opposing goalkeeper. Just minutes in the start of the second half, the Leathernecks were putting the Bulldogs under lots of pressure, keeping the ball in their offensive half. About 10 minutes into the half, senior defender Orsy Gonzales had a low shot that just nearly missed the goal but the shot went wide. Junior goalkeeper Tim Hansen was in goal for the Leathernecks the whole game. He had a few saves throughout the match but was not put under too much pressure. Both teams managed to put together some good series of passes but seemed to have trouble finishing the ball. As the second half continued, the game got physical as many fouls were called. With about 15 minutes left, sophomore midfielder Paul Kirdorf took a free kick right outside the box. The ball was chipped back post but unfortunately, was not able to be finished. Nearing the end of the game both teams had a few more opportunities to take the lead but the game remained scoreless. No matter the outcome, these spring games allow the team to prepare for the upcoming fall season. After losing some seniors, some new players were able to see the pitch in this match. It is a good opportunity to work out any miscommunications before the games actually matter. This first match was just one of the seven spring games that is scheduled for Western. None of these games will count toward anything but are just friendlies that allow the players to get more game experience. Their next game is set for April 7, at home against Central Methodist University. CMU is an NAIA school from Fayette, Missouri.